Karnataka, India is the Country's Sixth Largest State! The state of Karnataka is located in southwest India and shares its western border with the Arabian Sea, its northwestern with Goa, its north border with Maharashtra, its eastern with Andhra Pradesh, its southeastern border with Tamil Nadu and its southwestern border with Kerala. The state’s area is roughly 74,100 square miles and it has a population of more than sixty-one million, making it India’s ninth most populated state! There are several stories about how the state got its name. Some say it gets its name from the Kannada words karu and nadu, elevated land. These same words can mean black land, which could refer to a particular black soil cotton found in the mountains here. The state was first formed under the name Mysore on November 1, 1956, with the passing of the States Reorganization Act, but was renamed in 1973; its capital is Bangalore. Most people here speak the language of Kannada, but the languages of Urdu, Telugu, Tamil, Marathi, Hindi, Konkani, Malayalam and Kodaa Takk are also spoken. People follow the religions of Jainism, Hinduism, Islam, Buddhism and Christianity here. The state’s history dates back to ancient times, when people made and used axes and other blade type weapons. Gold has been found here that came from the Harappan Civilization, which suggests ancient trade and a shared ancient culture between tribes of these respective regions. This state was home to some very powerful empires during ancient and medieval Indian history. Before third century BC, most of the state was part of an empire called the Nanda Empire, but control was taken by the more dominate Mauryan empire under an Emperor Ashoka. When the Mauryan Empire’s power dissolved, native kingdoms sprung up all over the region and ruled for some time. These kingdoms were followed by empires which ruled and battled one another for control of land on India’s southern plateau, including this region; this occurred for centuries. The state is broken into three major geographical zones; the coastal region of Karavali, the hilly region of Malenadu and the plains of the Bayaluseeme; most of the state is desert plains. The Krishna and Kaveri Rivers are the two major river systems of the state that distribute water through smaller rivers, and both flow east into the Bay of Bengal. The state has four seasons; the winter from January through February, summer from March through May, the monsoon season from June through September and the post-monsoon season from October through December. The coast receives the most rain with an average rainfall of 143 inches annually. The temperature here ranges from 37 degrees Fahrenheit in the mountainous regions to 115 degrees Fahrenheit in the desert plains. About twenty percent of Karnataka is covered by trees forests. The government of Karnataka is parliamentary with two democratically elected houses, the Legislative Assembly and the Legislative Council. The Legislative Assembly consists of 224 members who are elected for five-year terms. The Legislative Council is a permanent body of 75 members whom are replaced as members retire. The government of Karnataka is headed by the Chief Minister who is chosen by the ruling party members of the Legislative Assembly. This is somewhat similar to a state government in the United States. The Karnatakan economy has an estimated Gross State Domestic Product of about $60 billion, which would make it India's sixth highest. More than half of the state’s employed residents work in agriculture and the state is a major manufacturing location for the large public sector industries of Hindustan Aeronautics Limited, National Aerospace Laboratories, Bharat Heavy Electricals Limited, Indian Telephone Industries, Bharat Earth Movers Limited and Hindustan Machine Tools and more. Most of these major hubs are based in the capital city of Bangalore. Many of India's premier science and technology research centers, such as Indian Space Research Organization, Central Power Research Institute, Bharat Electronics Limited and the Central Food Technological Research Institute, are located here too. In addition, the Mangalore Refinery and Petrochemicals Limited oil refinery is located here. Karnataka is also home to more than 320 biotechnology firms. The state boasts a vibrant culture that brought India the artistic musical contributions of Carnatic and Hindustani music styles. The classical musical style of Gamaka was also based on Carnatic music practiced in Karnataka and Kannada Bhavageete is a pop music genre that is popular here too. The Mysore style of painting is taught in painting schools that promote traditional painting. There are many colleges in the state that teach everything from biotech to health care, which is why so science, technology and medical companies are stationed here. People here eat a lot of rice. A popular Indian dish is Bisi bele bath, which is a flavorful rice dish, but different districts of the state enjoy different cuisines. A popular festival celebrated here is the Mysore Dasara, which is a harvest festival that celebrates the importance of food and religion. There is so much for tourist to see in Karnataka; ancient sculptured temples, modern cities, scenic hills, seemingly untouched beaches! The state is commonly ranked as the fourth most popular India tourism destination state. The gorgeous waterfalls of Karnataka are a must-see attraction! 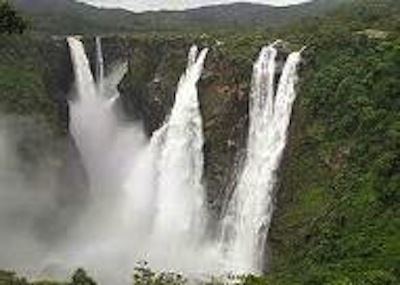 The falls include Jog Falls, which is India’s single tallest waterfall. In addition, the state's most popular beaches include Murudeshwara, Gokarna and Karwar beach areas and several Hindu temples, including the famous Udupi Sri Krishna Matha, the Marikamba Temple at Sirsi and the Sri Manjunatha Temple at Dharmasthala are here. These temples attract people Hindus and tourists from all over India. There are several Jain temples named Shravanabelagola, Mudabidri and Karkala, which represent Jainism’s strong movement achieved during medieval India history. Interestingly enough, many people visit this state for its wide array of health services. The state has a large health care structure and offers many alternative health therapies, which attract people from all over. All in all, an impressive state with many reasons to visit. Leave Karnataka to discover the other states and union territories of India. Find out what it's like in India today! Visit our homepage to discover more of India!